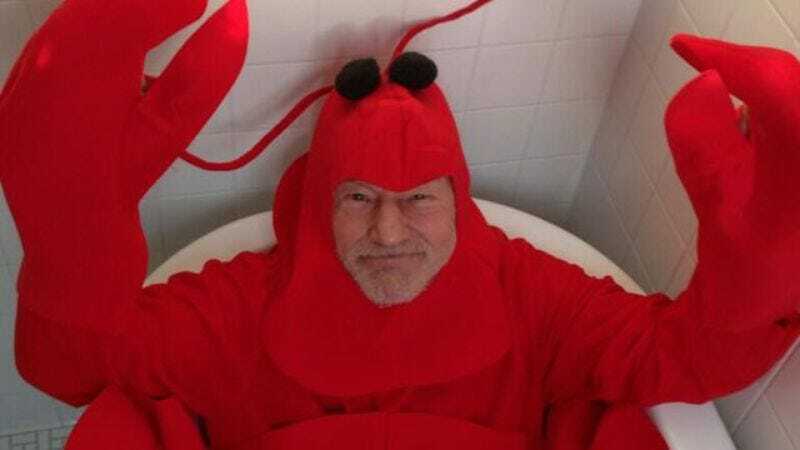 As half of the Internet’s favorite team of best friends, Patrick Stewart has brought countless hours of smiles to everyone who enjoys looking at pictures of old men in matching hats. In fact, after that time he spoke out against domestic violence and taught us all how to do a “quadruple take” while touching his girlfriend’s feet, some people assumed that he could do no wrong. Now, though, Stewart will see just how much the Internet loves him by breaking out of the “lovable grandfather” mold and—according to The Wrap—taking on the role of a white supremacist gang leader in Jeremy Saulnier’s Green Room. As we’ve previously reported, Green Room will star Anton Yelchin as a member of a punk rock band who runs afoul of some skinheads when he witness them killing someone. Imogen Poots co-stars as a friend of the person who gets murdered, and she joins Yelchin and his band when they take shelter in a concert venue’s green room. Stewart will be Darcy Banker, the “unflinching and industrial” leader of the racist murderers. We’re not sure what makes someone “industrial,” but it certainly doesn’t sound like what we’ve come to expect from Stewart and his cute Christmas photos.